There’s nothing particularly difficult or brilliant about a newspaper such as Private Eye showing off how it has wrangled some old codger close enough to a satire-induced aneurysm that they’ve chosen to cancel their subscription. In fact, given the demographic of the Eye, your average reader is more likely to receive a eulogy within the next month than another issue. The apostles of the holy church of ‘satire’, were represented in Varsity last month by Samuel Isaac. Isaac writes that our satire “shouldn’t be ideological and it can never go too far”. This is a naive position which at once undermines the subversive power of comedy as well as reinforcing its oppressive potential. Yet, I do agree with Isaac’s point in part; the ‘but seriously’ moment in late night talk shows is quite convenient. When you are outraged on a weekly ‘clippable’ basis, you wonder how much someone like John Oliver really cares about the topics dealt with on his show. I imagine it’s measurable in the seven figure range. It’s this faux challenging ‘political comedy’ that treads old ground and does more to stroke the egos of its audience than broaden horizons. John Oliver is not the first to do ‘serious’ comedy, he has appropriated the established styles of his predecessors Colbert and Stewart. 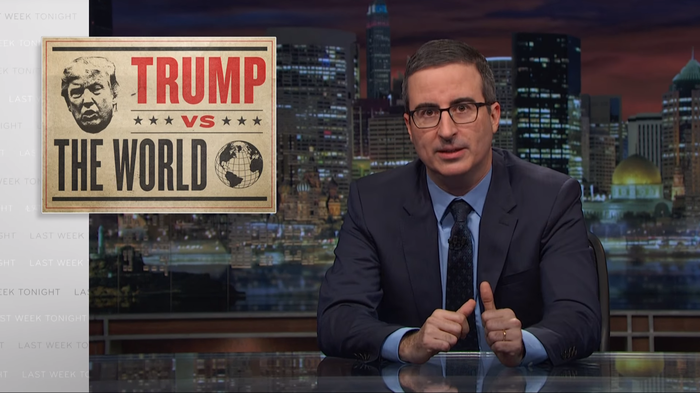 There’s more to politics in comedy than a half-naked John Oliver strangling a long deflated Trump Baby on live TV. Perhaps the problem is then that the power, which the sickly sweet ‘but seriously’ moment has, is lost when it’s not driven by lived experience. Satire has never been about “unique escapism”. It’s about confrontation, exposing hypocrisy and, when necessary, being direct. The ideology switch doesn’t just get turned off when you sit down to write. I’m someone with a mental illness and learning difficulties who likes to perform stand up comedy about my condition. Being classified as disabled your entire life becomes political. I believe there’s more affective power in comedy that’s intensely personal, but there is no strict divide between political and personal when you’re on the margins. It’s exactly this “current trend of earnest comedy [which] troubles me”, writes Isaac. What troubles me personally is not having enough money to afford my antidepressants. Having to go on yet another year-long waiting list for talking therapies and being denied provisions by the University. When government funding on disability is being slashed by the day it’s tempting to wallow in misery and self-pity. If this is something comedy can challenge then it should be pushed to the forefront, not hushed to the side by fretful moderates. I’d like people to laugh but I’m also of the belief that we can do a little more than that. Comedy’s about light and dark, let’s not ignore the suffering of the marginalised so the privileged can sit back and cherry pick the bits of experience they aren’t troubled by and chuckle away innocently. Hannah Gadsby tackles this more eloquently than I ever could in her Netflix special ‘Nanette’ and I’d recommend you watch it to see how ‘earnest’ comedy can be so much more powerful than Isaac gives it credit for. Not all comedy is political nor should it be but I find taking ownership of trauma and discrimination and making people laugh is the only way to cope at times. Disrupting the dynamic of power by choosing when people laugh at me and having it be my choice is, I would argue, a distinctly political move. Comedy is one of the few mediums in which I feel comfortable expressing my experience genuinely despite the layers of self deprecation and irony. Then again, it’s all just jokes isn’t it? Wouldn’t want to get too serious.